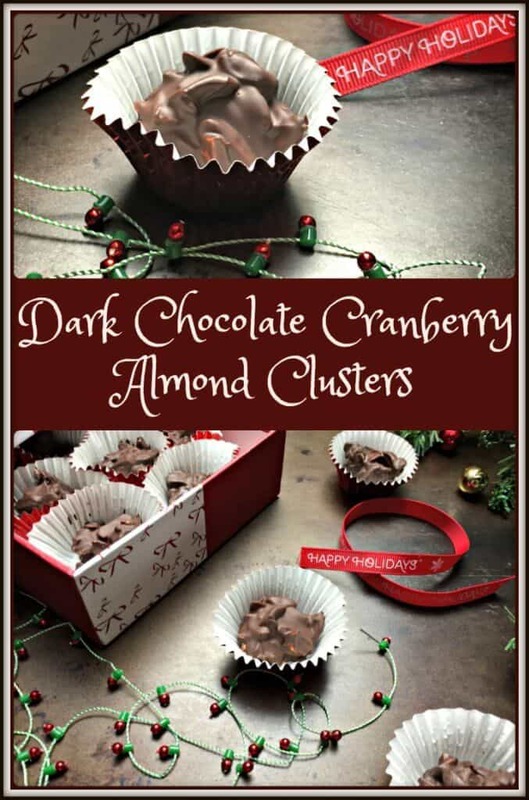 Here is a quick and simple recipe for Dark Chocolate Cranberry Almond Clusters; these healthy chocolate clusters also make the best hostess gifts and the perfect no-bake addition to your holiday dessert tray. Despite the fact that there is still no accumulation of snow in Montreal, the holidays are fast approaching. Between baking, cooking, cleaning and shopping, it can definitely get a little overwhelming. This simple and quick no-bake recipe for Dark Chocolate Cranberry Almond Clusters can be made in minutes and with only four ingredients. This simple chocolate clusters recipe begins by melting chocolate in the top of a double boiler over water that is barely simmering. Stir until chocolate has almost completely melted. Alternatively, you can melt the chocolate in the microwave, at 30 second increments, until fully melted. At this point you have a mound of chocolate covered goodness! Spoon about a small teaspoon of the mixture in individual miniature paper cups. Et voila! 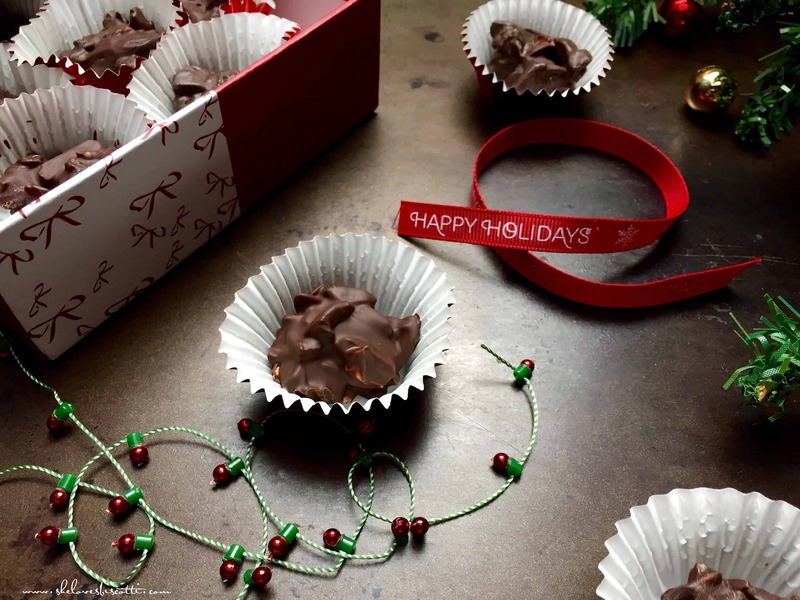 You have just created chocolate clusters -the perfect hostess gift. Nutrition tip: Did you know that dark chocolate is a great source of antioxidants? Not white chocolate, not milk chocolate… dark chocolate. But not all dark chocolates were created equally. In order to get all the benefits, choose dark chocolate that has at least 70% cacao solids. When looking at the list of ingredients, it should be the first one labelled. Cacao is the ingredient which contains the flavonols (those are the all-important anti-oxidants). As far as the amount you should be eating – limit yourself to a few squares per day, more is not better. I couldn’t think of a better way to get my daily dose of anti-oxidants. Just remember, don’t gulp a glass of milk at the same time, studies have shown that milk interferes with the absorption of the anti-oxidants. And always share your squares! I found this chocolate clusters recipe over at Kraft Canada over a decade ago and I’ve been making it ever since, with a couple of changes, of course. I replaced the white chocolate with dark chocolate. As far as the add-ins are concerned, I usually use whatever I have on hand, but I have my preferences. Feel free to use any nut and dried fruit combination. These no-bake Dark Chocolate Cranberry Almond Clusters are truly quick and simple to create. They make a wonderful addition to your cookie tray, they make great hostess gifts, and the dark chocolate may actually have some health benefits. This recipe for Dark Chocolate Cranberry Almond Clusters is quick & simple; they also make the perfect no-bake addition to your holiday dessert tray. 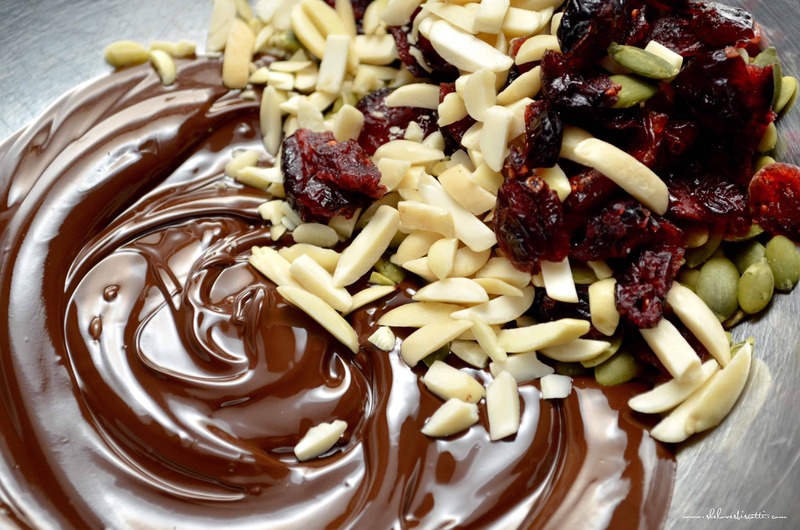 Break the dark chocolate into little pieces and place in a heatproof bowl. Place the bowl over a pot of simmering water. Make sure the bottom of the bowl does not touch the water. Stir in the pumpkin seeds, almond slivers and dried cranberries. Spoon about a small teaspoon of the cluster mixture in individual miniature paper cups. Place in refrigerator to allow chocolate to set. Can be stored in airtight container in the fridge for up to 2 weeks. LOVE THIS CHOCOLATE CLUSTERS RECIPE? PIN IT TO YOUR CHOCOLATE BOARD! My pleasure! In fact, some of the ingredients can be switched around to suit your preferences. Appreciate your comment. Yum! A great hostess gift for sure! I like to make these with the kids because they can put in whatever nuts and fruit they like! I have dried cranberries, nuts and seeds at home, I just have to grab some dark chocolate to make these. This is such a delicious chocolate snack bite which is so easy to make in no time. My grandson would love it. Thanks Maria. These sound fantastic! I love the dark chocolate cranberry combination.